Enjoy a scenic ride through the beautiful South Tyne valley from Alston station. Travel to Kirkhaugh, Lintley Halt and back on one of our trains hauled by vintage steam or diesel locomotives through lovely Pennine scenery - catch sight of deer, look out for soaring birds of prey, you may even glimpse a red squirrel. Your journey to Alston, which lies at the crossroads of five routes, takes you through the stunning landscape of the North Pennines Area of Natural Beauty (AONB). 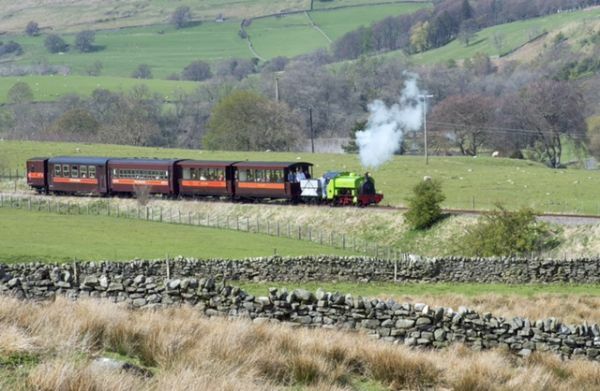 Once there, you can watch the volunteer staff prepare the engines, have a bacon buttie, wander beside the river Tyne and sit back in a vintage coach to be taken gently along the valley on the north of England’s highest narrow gauge railway. Why not walk or cycle one way to explore the South Tyne Trail? Cyclists, walkers and dogs are all welcome! Bring a picnic or drop into the Buffer Stop Café at the station for freshly made food; there’s a gift shop plus free car and coach parking, just minutes from Alston town centre. New in 2016 we have the Discovery Centre. Admission is free, the Centre tells the story of “The trials and triumphs of a rural railway”. The history of the area; the rise, fall then rise again of the railway, along with the work of the South Tynedale Railway Preservation Society are presented in very accessible information along with a stunning range of photographs and artefacts. Trains operate from late March to October, running daily at peak times (school holidays). Check our website for the latest timetable plus details of special events and galas including the Santa Specials in December.